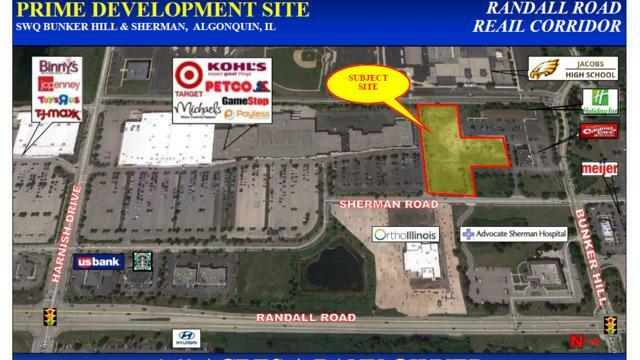 4.60 Aces- Heart of Algonquin's Randall Road retail corridor. Bank owned commercial development site situated between Holiday Inn, Colonial Cafe, Jacobs High School, and the Woodscreek Shopping Center (Target, Kohl's, Petco, etc). Fully improved with utilities to site and off-site detention. Randall Road Pylon Signage. Zoned B2. Ideal for retail, office, medical office, hospitality/hotel, entertainment. Potential for assisted living or senior housing. Bank will consider financing and participating with Buyer in the due diligence and/or entitlement approval process (call broker for details).